European LED screen designer and manufacturer Pixled exhibits at the 2013 Prolight+Sound exhibition in Frankfurt, Hall 9.0 E17. Belgium based Pixled has a wide portfolio and several full product ranges of indoor and outdoor LED screen solutions which are solid tile based as well as flexible creative products. 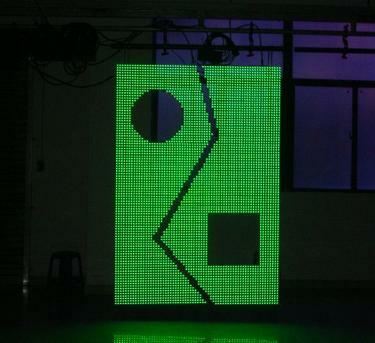 The focus at pl+s Frankfurt 2013 in particular will be Pixled’s highly creative LED strips and spheres. The FS-2425 is a strip product for fixed indoor installations, offering a 24mm pixel pitch, which is available in all possible lengths between a minimum of 4 pixels and a maximum of 64 pixels. The strips are attached to an aluminum backbone with a single connector for data and power. The data and power cables are concealed in the backbone ensuing a mega-neat appearance and an installation depth of only 1,8cm providing high versatility. Various FS-2425 strips can be mounted and joined together to make up a myriad of different sizes and all possible shapes. The 'screen' is controlled just like a standard video screen and can accept all types of inputs. Pixled also launches its FX-200 spheres - with 360° viewing angle - which are bright enough to create effects on stage and robust enough to survive the rigors of the road. On stages and in so many performance and presentation scenarios, viewing angle is major parameter. The spheres are mounted on a string and hang 20cm apart from each other. Next to these creative and flexible eye-catchers, Pixled will be exhibiting its popular Linx-9 MC rigid modules and Linx-18 flexible curtain. Last but not least, a high resolution 4mm screen will be installed in the centre of the booth. © 2000 © 2013 Pro-Light-News. All rights reserved. Thank you for visiting Pro-Light-News.